You may think you're a high-tech power user who knows all the nooks and crannies of Windows, iOS, and Android, but let's be realistic: There could be at least a few undocumented (or poorly documented) commands, control panels, and apps that have slipped by you—maybe more than a few. We've dived deep into each OS to uncover the best hidden tips and tricks that can make you more productive—or make common tasks easier. Got a favorite undocumented tip to share with readers? Add them in the comments section at the end of the article. Few Windows users take advantage of this unsung, universal shortcut, available via the key combo Windows-X. 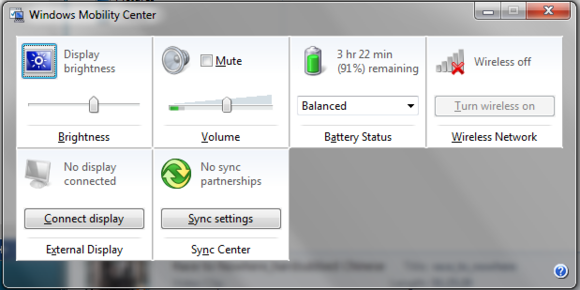 It launches the Windows Mobility Center, a control panel that only appears in Windows 7 (and Vista). The Mobility Center is kind of a one-stop shop for everything related to mobile PCs. Through this centralized control panel you can control your battery profile, wireless on/off status, display brightness, and speaker volume. If you use an external display or the Windows Sync Center, controls for these tools are also available through Mobility Center. Open the Windows Mobility Center with the Win-X key combo. It may not add anything new to Windows, but it does let you do in a single keystroke what you’d normally have to juggle through a half-dozen different control panels. Note: Win-X unfortunately does something entirely different on Windows 8, bringing up a list of shortcuts to a variety of other Windows subcomponents. Anyone who has ever provided tech support for a clueless relative knows how painful it can be walking them through the steps they took to mess everything up. Windows now includes a tool called the Problem Steps Recorder. You’ll find it under “Record steps to reproduce a problem” in the Windows 7 Start menu or just “Steps Recorder” in Windows 8. Capture every click and keystroke with Steps Recorder. Launching this tool opens a very simple dialog box with only one real option: Start Record. Press this, and Windows will record everything you do—mouse movements, clicks, keyboard commands, and typing. When finished, the file is saved as an HTML document within a ZIP file, including screenshots of every single step that was taken and a description of each, helping you pinpoint exactly what went wrong and where. Need to open a second copy of Explorer or whatever program you're working in? Easy: Hold down Shift and click on the taskbar icon, and a second instance of the application will pop up. You can do the same by right-clicking an icon and selecting the application’s name (usually the third option from the bottom of the list). This works the same way in Windows 7 and 8. The venerable Print Screen system has always been a bit too convoluted for regular use. The Windows 7 Snipping Tool went a long way toward improving the way you snap images of your desktop, letting you crop and annotate images and then choose where to save them. 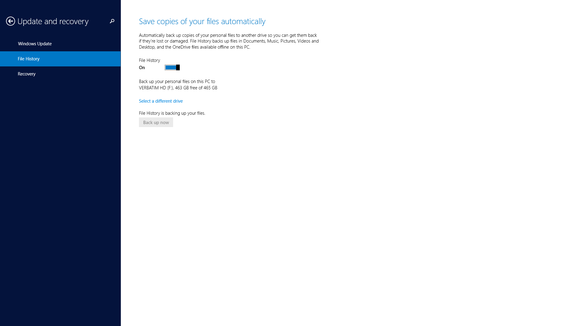 In addition to the Snipping Tool, Windows 8 offers an extra Print Screen upgrade. Instead of just pressing the PrtSc button, hit Win-PrtSc. This takes a full-screen shot, then automatically saves it to your Pictures library—a real timesaver. 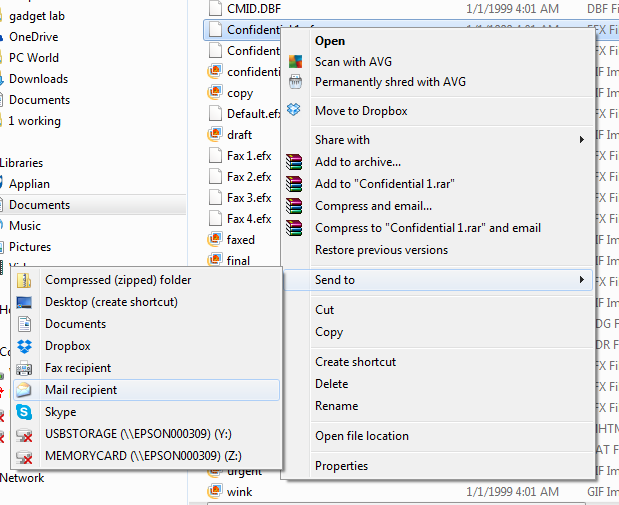 If you use an offline email client like Outlook, Windows 7 and 8 make it incredibly easy to send files as attachments without having to sift through your directory structure within the email client. Just right-click on the file you want to email and select Send to > Mail recipient. Your email client will take over from there, opening a new email message with your outgoing file already attached. Note: You’ll find all kinds of additional options in the “Send to” menu depending on what services or hardware you use. For example, you can send to Dropbox, Skype, or a thumb or network drive, among other options. Right-click to easily email a file. Windows 8 adds a mind-numbingly simple backup system called File History that few people seem to know about. To use it, simply plug in an external hard drive and Windows automatically archives files to it. Even better, Windows saves old versions of your files, so if you make a colossal mistake and overwrite your novel with the grocery list, you’ll be able to get it back. Turn on File History by searching for that phrase within Windows and selecting On. Just remember to have an external drive connected, or network drives are also supported. A different app, available under “Restore your files with File History” in Windows, can be used to recover lost data. Use File History to back up your data. Swipe up for instant access to common functions. Most iOS users have only seen this app if they opened it by accident. Swiping upward from the bottom of your phone or tablet’s display will bring up an incredibly useful menu with instant access to nearly a dozen common functions, including easy on/off toggles for Airplane Mode, Wi-Fi, Bluetooth, Do Not Disturb, Rotation Lock, a brightness slider, music controls, and access to four utilities: the clock/timer, calculator, camera, and a flashlight. Once you realize it’s there, you’ll use this tool all the time. Need proof of when an SMS message was sent or received? Just drag left on the Messages screen (once you are looking at a contact’s message history) and you’ll reveal the exact time at which every message was sent. Open the compass app and swipe to the left. Your phone turns into a level that works both horizontally and vertically, perfect for getting that picture on the wall just right. 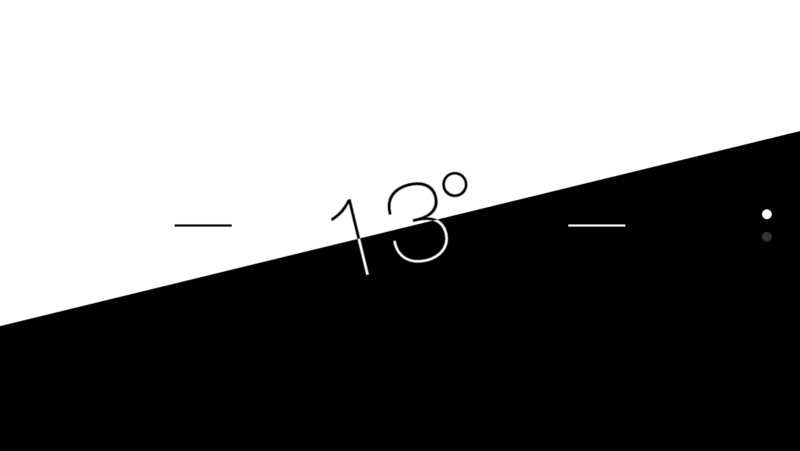 Recent iOS updates have also added a smaller level on the standard compass app screen. Look for the smaller circle and + symbol within the outer ring. When the small + and the large + line up, the phone is level. Unlock the level in your iPhone by swiping left in the compass app. This feature, new to iOS 7, requires some work to set up, but users with physical impairments or who just want to show off some tech magic may find it to be the iPhone’s coolest trick. Through the Switch Control system, you can tilt your head left or right and have your phone perform certain actions—typically scanning through menus and selecting items on said menu. Setting this up requires a little digging. Start under Settings > General > Accessibility > Switch Control. Select Switches > Add New Switch > Camera. Here you can assign different actions for “Left Head Movement” and “Right Head Movement.” Experiment with the various “scanning” options and Select Item—or turn Auto Scanning on at the previous menu to simplify things. You’ll also need to turn on Switch Control to get things started. 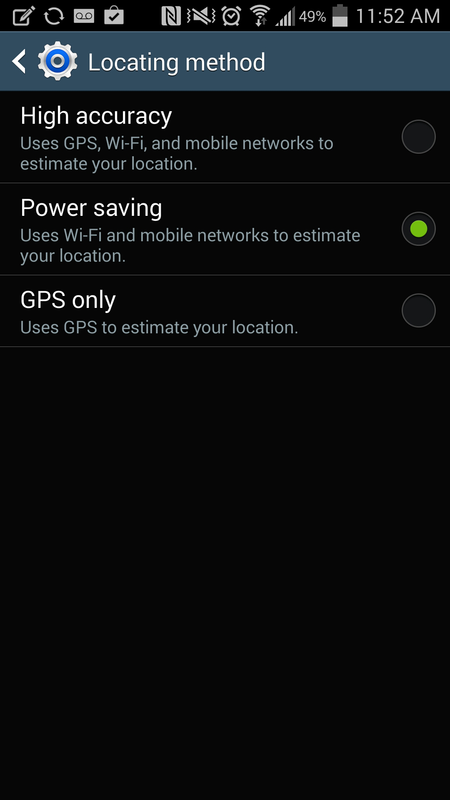 'Power saving' location mode cuts out GPS data. 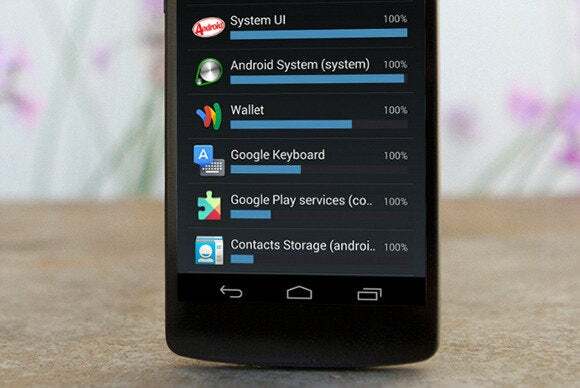 GPS is a notorious power-sucker, but Android 4.4 KitKat lets you choose to sacrifice some of your location accuracy in exchange for extra battery life. You don’t lose location information altogether. Rather, in 'Power saving' mode, your device uses only Wi-Fi networks and nearby cell towers to estimate your position, reducing drain on your battery. Activate 'High accuracy' mode to use real GPS satellite information to determine where you are…and watch your battery life quickly drain. You’ll find both options under Settings > Location. Mourning the loss of Developer Mode on your KitKat-enabled device? Developer options, which give you access to USB debugging, the ability to limit background processes, and fine-grained tools like displaying a CPU usage overlay, are still around—just hidden. To enable them, visit Settings > About Device/Phone. Scroll down to the Build number at the bottom of the screen and tap that number seven times. A message will alert you that Developer Options have been re-added to the Settings menu. Your hungriest apps at a glance. With Developer Options turned on, you can now delve into your device’s memory utilization on an app-by-app basis. Just visit Settings > Developer options > Process Stats to get a handy visual display of your device’s memory consumption. This can be especially helpful if your Android device seems sluggish. Android “L” 5.0 (ship date unknown) will feature a new runtime called ART, which replaces the older Dalvik runtime that all existing Android devices use. 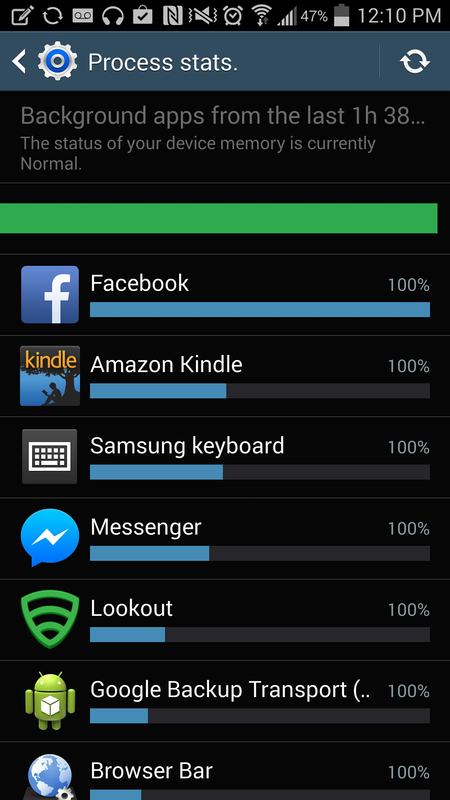 (Long story short, this is a general performance enhancement for just about every Android app.) If you have Android 4.4 KitKat, you can get started with ART today, but bear in mind it is still experimental. 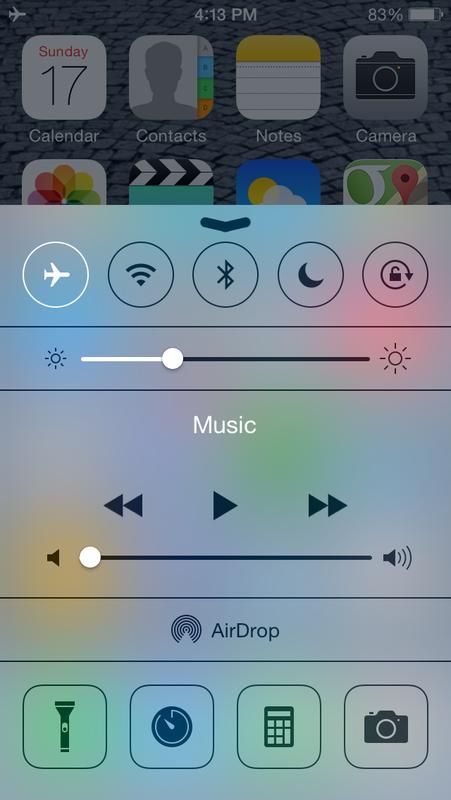 To turn it on, access the Developer Options as outlined above and choose Select Runtime. Most users report few problems, if any, with the setting.